Designing dinosaur exhibits is a big job. It’s even bigger when they are in the great outdoors. On islands surrounded by moats. With roller coasters. Coming spring 2012, Cedar Fair Entertainment opens four more Dinosaur Alive! exhibits at amusement parks across North America. Double Dare played a key role in designing the outdoor attraction, which first opened July 2011. We lay the foundation for the interpretive storyline at Kings Island (OH), which was touted as the “largest outdoor animatronic dinosaur park in the world”. This work defined many of the key features that were later rolled out at all the Dinosaur Alive! parks. In case you missed that bit about this being a challenging project: during our site tours of the parks, we braved thorns, snakes, wasps, mosquitoes, blistering heat, torrential rain and mud up to our knees. 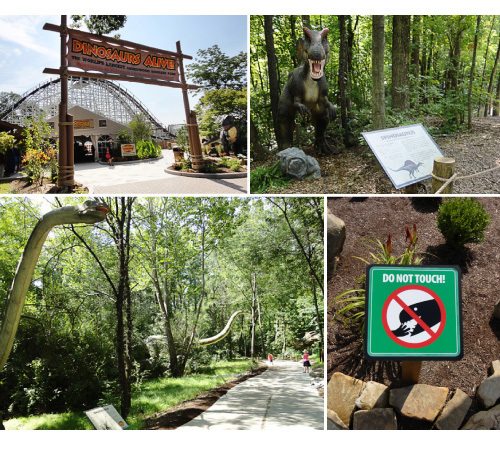 We also delivered the project at break neck speed: five parks with over 200 dinosaurs in a little over a year. One thing is for sure, for an extinct bunch, these dinosaurs sure are busy. Fernie Museum Opens – Without Disaster! Want an exhibit that gets people smiling? We’d love to design it for you.